US TV clip from 1998, featuring the circlemakers.org chaps making a commissioned circle in New Zealand (see photo). See also this article on circlemakers.org for more background. This film caused rather a stir at the time; Freddy Silva in particular got into somewhat of a lather. This entry was posted in 1998 Season, circlemakers dot org, Freddy Silva on July 1, 2015 by admin. 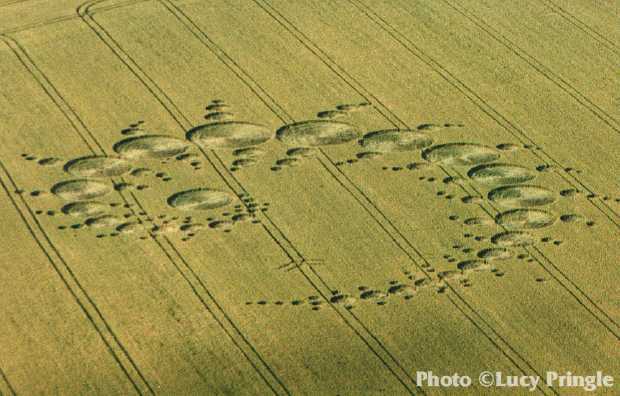 The idea that ‘if there are people making crop circles all over the place, how comes they’re never spotted?’ is one that we still see repeated in books and websites over and over. And it simply isn’t true. With this in mind, we thought we’d compile a list to counter the myth. There may well be others that we’ve missed out here and it does also have to be said that these reports vary in quality, with some of them being quite sketchy. If anybody has further information on any of these accounts, or any others that we’ve not listed, please let us know. ‘I had to get this on video and I knew that the large image intensifier would show far more detail than the small portable sight. ‘Back at the car I wrestled in the dark with cables, batteries, tapes, and all the other kit I needed to record the evidence. It was some time before I stumbled back up the track and looked for a good vantage point to set up. Makers caught by the farmer; formation unfinished. There’s a slight degree of confusion about this case, involving two formations in the same wheat field directly below the Cherhill white horse; one a ‘flower’ design, the other a thick ring surrounding a small central circle. Some reports state that the ring appeared a few nights earlier, though the farmer himself, Mr M Ainslie, writes (on Paul Vigay’s Crop CircleResearch website): ‘Both formations appeared on the night of 2.7.02 [presumably he means 2.8.02] and are in similar place to the 1999 formation.’ And he should know, we guess. He also caught the culprits whilst in the process of making it/them, hence the ‘unfinished’ quality of the flower (some of the outer petals were flattened, some not) – presumably, if both appeared in one night, the same team were also responsible for the ring. Mr Ainslie also writes that despite rumours to the contrary, ‘as farmers of this land we have never given permission for a formation, but have on occasions been telephoned after a formation has appeared and given names of supposed perpetrators.’ As far as we know the identities of the circlemakers in this particular case are not known – apparently they fled the scene when the farmer arrived. Note also that, according to Jonah Ohayv, the team left a stomper behind. An overlapping ring design, located close to the road in a wheat field below Golden Ball Hill, close to East Field. The makers were observed by a group of croppies on Woodborough Hill (apparently torches were seen in the field). The identities of circlemakers / oberservers are not known to us. The creators of this formation were seen by several different groups of people, including researchers Andreas Mueller and Werner Anderhab, who observed the half-finished formation at 2.00am through night vision. A very thorough write-up of this case can be found in Allan Brown’s article The East Field/SouthField Duality. To save us having to repeat all the details here, we’d recommend you go there. Cars were seen leaving the area after the formation was completed. Ron Russell later admitted that the formation was the work of his team, and that they had the permission of the farmer. This account has been questioned by some, who maintain that it does not prove that the people Bearcloud saw leaving the field made the circle. Another point made by John Lundberg, which we have to say we agree with, is that it seems odd that it would take eight to ten people to make what is a relatively simple formation, which requires little in the way of measuring and flattening and which – we believe – could easily be accomplished by two or three people. What were the others doing? Standing around watching? Or did they take turns to do bits? For an alternative explanation of this formation’s origins, see Andrew Buckley’s report here, in which he claims to have witnessed it being created by an Apache helicopter. Inevitably, he didn’t think to film the incident using the ‘Panasonic video camera’ he makes a point of mentioning he had in his possession, even though by his estimation the incident lasted for several minutes. This relatively simple and – in our view – somewhat clunky-looking formation took a staggering four nights to complete. Contemporary records indicate that the creators were spotted at least once, though details are sketchy. Peter Sorensen writes that ‘on the second night they were spotted by researchers with night vision up above them on the hill’, and Freddy Silva writes that they were spotted twice, though does not give details. It’s widely known that this formation took two nights to complete, appearing on the morning of 2nd August as an outline with flattened central circle and perimeter, with the much more accomplished and familiar design being executed the following night. Even at the time we remember reports that the makers had been rumbled mid-creation on the first night, and Andreas Mueller’s field report that first morning described ‘a rough executed, very heavily flattened and mechanical lay’ and the finding of ‘three white marking-plates numbered 2, 4 and 6… known to be used by several hoaxers’ and presumably left behind when they fled the scene. It isn’t clear, however, who spotted them exactly, or even if they were spotted – if they were, we’re curious as to how the spotters knew they were there since the formation was on top of a hill and not visible from nearby roads. The only vantage point we can think of in the area where it might be possible to spot somebody is the top of West Kennett Longbarrow (from where it might even be possible to hear a particularly noisy team) or Silbury Hill, but only if some sort of illumination was being used by the makers. Freddy Silva, on his Crop Circular site, goes even further; he claims that ‘they were caught making it, by no fewer than three couples from two countries; two of these couples independently confirmed that an Italian TV crew even helped the hoaxers with the finishing touches!’ Again, no evidence, or identities, are given. Another account from Bearcloud (see Golden Ball Hill, 26th July 2004, above). This entry was posted in 1992 Jun Beckhampton, 2000 Jul 6 Silbury Hill, 2002 Aug 14 West Stowell, 2002 Aug 3 Cherhill, 2002 Jun 21 Avebury, 2003 Aug 2 East Field, 2003 Aug 4 Cherhill, 2004 Aug 3 Silbury Hill, 2004 Jul 26 Golden Ball Hill, 2004 Jul 31 Tan Hill, Allan Brown, Andreas Muller, Andrew Buckley, circlemakers dot org, Crop Circle Apocalypse (book), Darren Francis, Freddy Silva, John Lundberg, John Macnish, Jonah Ohayv, Matthew Williams, Peter Sorensen, Rod Bearcloud, Ron Russell, SC (journal), Werner Anderhaub on April 24, 2006 by admin. We have to admit that we’re disappointed that nobody responded to our request for photographs, taken either from Stonehenge or from the roadside, of the July 1996 Julia Set formation. Here’s why. Ever since this formation appeared, there have been claims that it formed in daylight. Part of said claim is that, if the formation had been made the night before, it would have been clearly visible from the road or from Stonehenge itself. But is this true? Some argue that it isn’t, and that due to the topography of the field in question, it simply went unnoticed until the afternoon. You can read one such claim, with diagrams, here. Rod Dickinson claims the same thing, on the Circlemakers website, here. We were first set along this line of enquiry after reading Freddy Silva’s Secrets In The Fields several years ago. Page 75 of this book features a shot, taken from Stonehenge and supposed to show the formation, with an arrow pointing to… nothing at all, as far as we can see. Which, for us, would seem to prove that the formation wasn’t visible from Stonehenge at all, though Silva seems to be using the picture to prove the opposite. So we repeat our request for photographic evidence that the formation was actually visible from Stonehenge and / or the road. The issue of the pilot (sometimes more than one, depending on which account you read) that flew over the field in question and stated that it wasn’t there earlier is a separate one, we think, and should be dealt with as such. We still want to see pictures. If you have such photographs please forward them to us. Please note that we’re not interested in ‘I was there, I saw it’ claims, or ‘you’re a bunch of debunkers / hoax boosters’ claims, or ‘I read x in y book’ claims, or ”who’s paying you off?’ claims. What we’re interested in is proof. The Stonehenge ‘Julia Set’ of July 1996. Photgraph by Lucy Pringle. This entry was posted in 1996 Jul 7 Stonehenge, circlemakers dot org, Freddy Silva, Rod Dickinson, Secrets In The Fields on May 13, 2005 by poppy amersham.